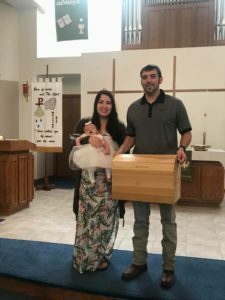 Faith Chest presented to Dustin and Melissa Pierpoint for Haizley's baptism at Trinity Lutheran Church on September 16, 2018. At each baptism, the Board of Evangelism presents the family with a Faith Chest to keep the baby's spiritual items in during his or her faith journey. The Faith Chests were assembled and finished by Dr. Michael Zaruba.